There is a lot of information here. Thank you for taking a moment here. I hope I can help you plan your trip to Chile! One Peak: allow four-days, including travel, orientation, warm-up, and time for weather. The absolute classic combination is: LONQUIMAY – LLAIMA – VILLARRICA. These are all fairly big peaks, with a variety of aspects for great skiing. They are steep, but not extreme. All three are iconic, conical peaks. If you have never skied toured before, or very little, and would like to start out on the right foot, it's hard for me to draw up a better combination than: CASA BLANCA – MOCHO-CHOSHUENCO – LONQUIMAY. The first two are not huge ascents and never get very steep- they are perfect places to hone new skills. Lonquimay is a little bigger, but at the end of the week, it's within grasp for most. If you want to "go big!" the combination of ANTUCO – LLAIMA – VILLARRICA allows for some huge days. Each one of these provides more than 5000-vertical feet of relief. Add in the availability of multiple laps on different aspects and it's easy to stack up some vertical. Skiing PUYEHUE is by far the most unique experience because you can actually ski into the crater itself. It's out of this world. It's a little more an adventure with horses and camping involved, but it's amazing. Turn this to a ten-day trip and you can add on CASA BLANCA as a good warm-up, and OSORNO on the tail end as a way to go out in style. 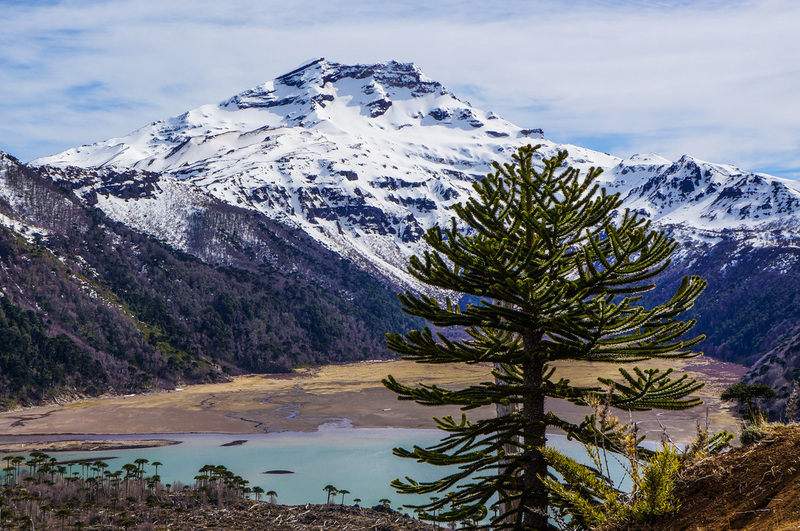 Lonquimay offers some of the best snow in Chile and is set in the heart of an incredible, ancient Araucaria forest. It is a moderately committing day; most clients reach the top in about 4.5-hours. It's also moderately technical - mostly skinning on the ascent, and about 40º maximum slope angle. We stay in a beautiful locally owned lodge with the option of individual hotel rooms, or a shared cabaña. We make our own breakfast and touring food, but have some traditional Chilean dishes specially prepared for us each night. This is really Chile at its finest. Llaima is a big peak. The most common route is up the west face, which involves crossing a huge plateau. An ascent of the north face is even bigger and more demanding, but a cool experience for sure. Over the years, I find myself doing the north face more often––it's a more dramatic day. The lodging situation is not ideal at Llaima. 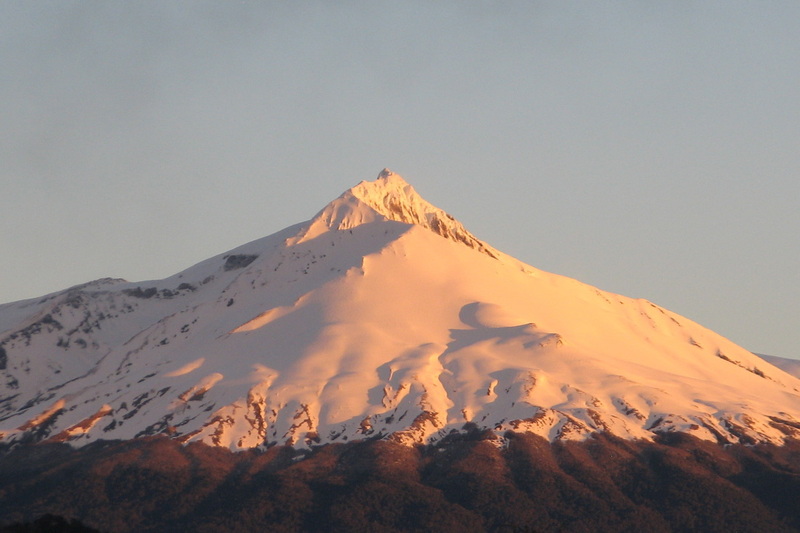 This peak can be done from a lodge in Malalcahuello or Pucón. It can also be done on the way between the two. 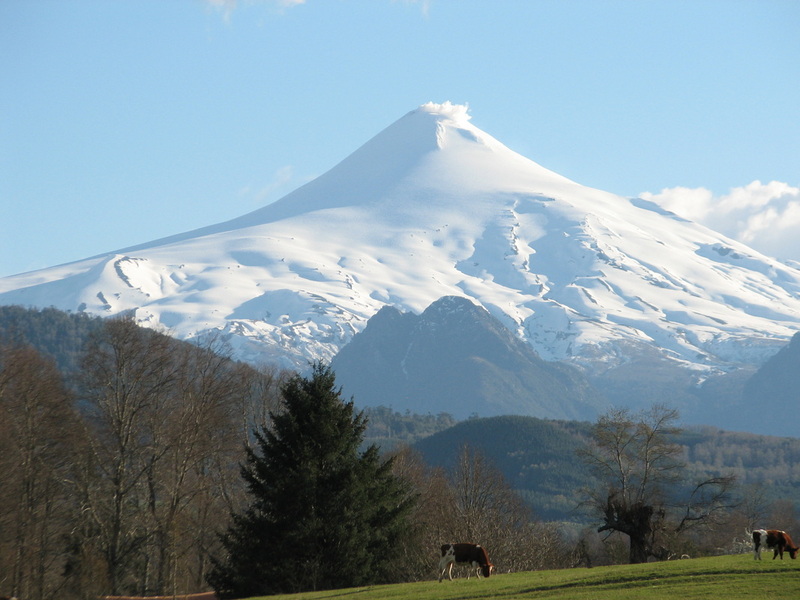 Villarrica is probably the most ascended peak in South America, certainly in Chile. The peak is very active, with a constantly smoking crater waiting at the summit. It is a fairly big ascent, but with patience most people can get to the top in about 5-hours. The skiing is some of the best in Chile, with plenty of variety. We stay in the town of Pucón. 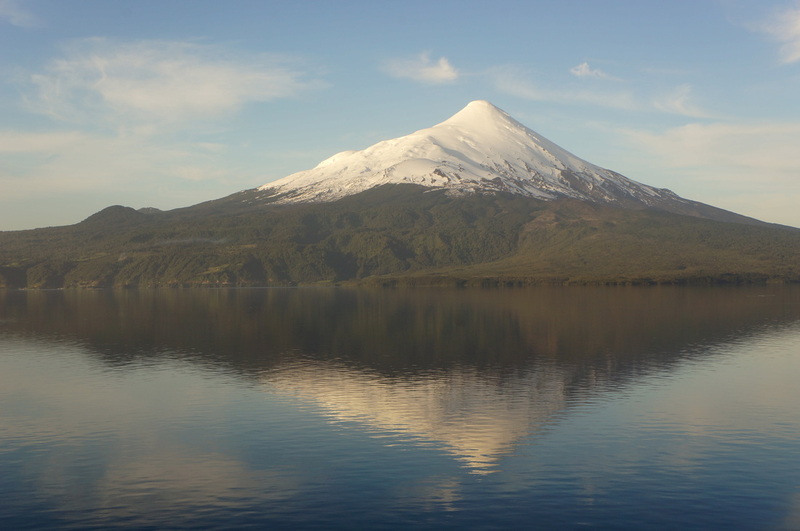 Pucón is quite the tourist town and we take advantage of some of the best restaurants in Chile. There are also several hot springs in the area, so a good soak is always a part of skiing Villarrica. This is the heart of the land of volcanoes. The twin-headed peak of Mocho-Choshuenco is located within the Huilo Huilo Wilderness Reserve. It's one of the easier peaks in terms of ascent and skiing challenge. Typically, a three-hour skin gets most people to the top, and the pitch isn't much steeper than a solid blue run at a resort. We stay at the Huilo Huilo resort, which can mean anything from private rooms in a hostería to a shared cabaña to the luxury of the hotel. We use the resort for dinner and definitely take advantage of the micro-brewery and the hot tubs. This is a great place for people looking for a comfortable component to their trip. Another relatively easy peak. This is a great place to warm up because besides the summit, there is a lot of good skiing - just on a smaller scale. This peak makes for good starting point for a few combinations. The lodging is at a small, boutique lodge in the middle of a forest between some of Chile's most beautiful peaks. There are hot springs and good trails for hiking in the area. The food is all home cooked. I mix traditional Chilean fare with food that helps fuel days in the mountains. 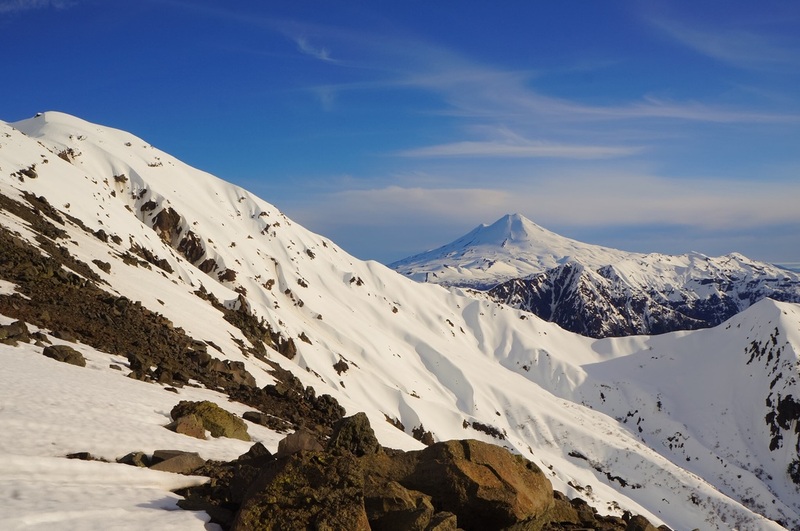 Osorno is one of the most perfect peaks I have ever seen – or skied. It is a little more committing, most people need about 5-hours to summit. The lower slopes of the peak are easy skinning and skiing. 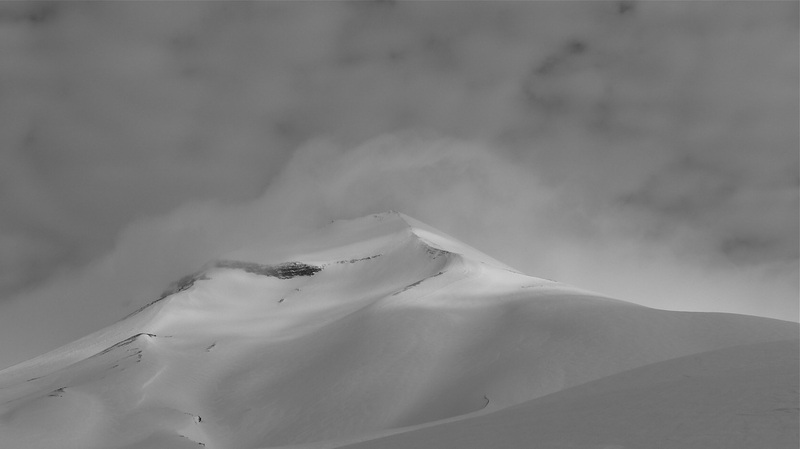 The upper cone is steeper rime ice. Crampons are needed. The corn develops beautifully and the skiing is world-class. We use an amazing hotel / lodge for accommodations. We can stay in private rooms or share a cabaña. We make our own breakfast and touring food, and then indulge in the hotel cuisine at night. We are right on the water's edge, well away from any town, so it makes for a very peaceful time off snow. Puyehue is the most unique experience of any of the volcanoes. The summit isn't a cone, but a gigantic crater. We actually ski INTO the volcano! There is a lot of skiing on this mountain, with the south and east aspects providing as well. The crater itself is steep, short and playful. A day here is worth millions of giggles. We use horses to ascend to snow line - a few hour journey. We then establish a base camp on the shoulder of the peak. We definitely allow for a few extra-days up here, just to make sure we get it when it's at its best. A week in the area, with three-nights of camping is ideal. This combines well with Casa Blanca and Osorno. Antuco is a beautiful peak. When Chile has had a good winter, this offers some of the better skiing on the volcanoes. It is a big day, more than 5000-feet to the summit, and there is some easy crampon walking to do as well. This is a great peak for the fit, because the snow conditions, if there's snow, inspire a second lap. The lodging is in a more rustic cabaña in the middle of the park. It's a little like camping, but warm and dry. We take care of as much of the food as possible, tend to have an asado, and plenty of wine. It's a beautiful setting and the traditional wood-fired hot tubs are great for taking it all in. Tolhuaca is an adventure! Just to the west of Lonquimay, but completely different in terms of the experience. It's remote, accessed by a long, bumpy road up to Laguna Blanca. From here, it's a long hike to get to the snow. Once on the snow you have to wind your way to the top. The mountain has been blown out from the sides and is glaciated on the south side. It isn't a straightforward, conical peak like its neighbors Llaima and Lonquimay. To simply climb to and ski from the summit of Sierra Nevada isn't very interesting–you skin along a long, low-angle ridge for a long time and on the return the skiing is flat, without any long pitches. The beauty of Sierra Nevada is on its sides. The lower slopes are in the araucaria forest, which can provide for some storm day skiing. The west aspect offers some of the most remote, steepest skiing in the area. And touring from the north side, over the peak and then down the glaciated south side into the Conguillo National Park would be an amazing tour. I know. That's a ton of reading, especially for the Internet. But this should be the trip of a lifetime, and a little thought and work up front makes the rest of the process a lot easier. If you're curious about a trip, just send me a note. Give me as much or as little information as you'd like and we can start cooking something up. Want to Make a Plan? Send Me a Note.